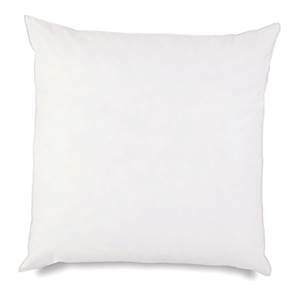 A favorite of interior decorators, our feather-fill pillow inserts look beautiful, offer great adjustability, and are soft with medium firm support. Fill material is 95% Duck Feather and 5% Down. The 100% cotton cover offers great airflow and breathability through the pillow. This square or euro style pillow form measures 28" x 28". We recommend ordering a pillow insert that is 2 inches larger than your pillow cover. Cover with a beautiful fabric and an elegant trim to add a bit of color and style to any room. Our Feather-Fill Pillow Inserts are Made in the USA.